Henk Ovink was appointed by the Dutch Cabinet as the first Special Envoy for International Water Affairs (2015). As the Ambassador for Water, he is responsible for advocating water awareness around the world, focusing on building institutional capacity and coalitions among governments, multilateral organizations, private sector and NGO’s to address the world’s stressing needs on water and help initiate transformative interventions. Ovink is also Sherpa to the High Level Panel on Water, installed by UN Secretary General Ban Ki Moon and President of the World Bank Jim Kim with 10 Heads of State / Heads of Government including Prime Minister Rutte from The Netherlands to catalyze change in water awareness and implementation. Henk is Principal for Rebuild by Design, the resilience innovation competition he developed and led for President Obama's Hurricane Sandy Rebuilding Task Force where he was Senior Advisor to the Chair. He has been Director General for Planning and Water Affairs and Director for National Spatial Planning in The Netherlands. Ovink teaches at the London School of Economics and at Harvard GSD and is member of the International Advisory Board for the City of Rotterdam. He was Curator for the 5th International Architecture Biennale Rotterdam 2012 ‘Making City’, and curated the debate series ‘Design and Politics: the next phase’ for Aedes network Campus Berlin. He initiated the research program and is chief editor of the series of publications with NAI010 Publishers on Design and Politics. Water represents man’s most challenging and complex risk. Floods and droughts, pollution and water conflicts combine in conceivably disastrous ways with rapid urbanisation, a growing demand for food and energy, migration, and climate change. Yet water’s connecting and interdependent strength also provides us with a not to be ignored opportunity: we can use water as leverage for impactful and catalytic change. 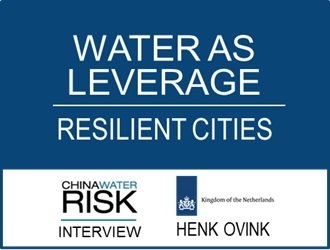 To find out how this can be achieved, China Water Risk sat down with Henk Ovink, the first ever Special Envoy for International Water Affairs. China Water Risk (CWR): As Special Envoy for International Water Affairs for the Dutch Cabinet, you are at the forefront of advocating water awareness, giving advice to governments, multilateral organisations and the private sector. What are your insights from the High Level Panel on Water? Have we fully grasped the implications of the current global water crisis? Henk Ovink (HO): I would say no, not at all. We are not even beginning to understand the complexity of water crises. Water is connected to social, environmental, cultural and ecological challenges. Without water, people have to run, causing migration streams or even conflict. There may be up to 20 million climate/water refugees by 2050. On top of that you have water stress and pollution – 2 billion people still drink contaminated water and around 5,000 people die every day due to water-related health issues in Africa alone. Water is also critical for emancipation and equality; especially in areas where women and children are still relied upon to draw water from the well. Then we have to consider the implications of “too much water”, from floods to storm surges to sea level rise. 90% of all natural disasters are water-related; and they are hitting us more frequently and harder every year, putting our assets and lives at risk in the cities we build around the world. These risks are hard to value, and therefore sometimes left out of the equation. So understanding the complexity of these linkages is essential to managing, valuing and governing water for a more water secure water world. It’s great that there is a High Level Panel on Water. It shows that water is raised to the highest level of attention from a political point of view. That level of attention has to also come from business, investor and NGO communities but it’s not yet there. While water is critical for security, sustainability and safety for society, we are not valuing it accordingly. CWR: This can seem too big a problem to tackle, so where do we start action? HO: We have to start by first understanding the complexity of the issue then we have to build projects by innovation – so test – innovate – learn and repeat. We should not always wait for the right policies to be in place because that will postpone our actions. There are four mains strands of action: long-term and comprehensive; and short-term and innovative, and a third strand is inclusiveness. If you want to change the world we have to include everyone. Inclusion is critically important. Not so much to ensure that what we do is legitimate, but out of collaboration comes the best ideas. The needs on the ground are inspirational for solutions and these voices need to be heard. Every community, every person, at risk or not, has a story to tell and has an idea of a pathway forward. Fourth, action also needs transparency to be accountable, to make a business case, and most importantly, to learn. We all make mistakes but only by being transparent can we learn and take that learning forwards as a step towards progress. So if we stand by these four principles: long-term collaboration, short-term innovation, inclusiveness and transparency, we build capacity among all stakeholders, among institutions as well as among individuals. All too often nowadays a plan becomes a book on the shelf; a project becomes an incident; inclusion is only an ambition and transparency is left out. Connecting all four principles by a design approach really helps develop a solution and connect through scales, time, and interest. This approach can really talk to the hearts and minds of ordinary people, governments, businesses, investors, assurers and insurers across the board. CWR: We have seen that you are not a fan of “low-hanging fruits” – why’s that? HO: The challenge with “low-hanging fruit” is that we repeat mistakes of the past by mistaking the solutions of the past to be the solutions of tomorrow. If we want to leapfrog into the challenging future we have to come up with new ideas, new projects, new types of investments and new ways to interact to avoid falling into a trap of repetition. So “low-hanging fruits” often make us do things the same way; while “high-hanging fruits” are more an opportunity to really do things differently and rethink. That being sad, “fruit” still “fruit” and progress is important. I believe that thanks to the complexity and the “wickedness” of the challenge, there is a huge opportunity to leapfrog and to make those connections across interests, scales, sectors and borders. I am a hopeful guy so I think although the challenges are big, we can make a difference by working on the ground with a long-term, comprehensive approach. CWR: Cities are likely to be heavily impacted by looming water risks and Asian cities account for 83% of the population affected by sea level rise. Having spearheaded the collaborative project “Water as Leverage for Resilient Cities: Asia”, could you expand on this a bit? HO: If you really want to leapfrog you have to innovate. You have to find a methodology where you work together, talent meeting talent, to understand the challenges, the interdependencies between them and find opportunities for change. I did this in New York after Hurricane Sandy hit. When I talked to President Jin of the Asian Infrastructure Investment Bank (AIIB), I told him that we need investors as part of the development process. Why? Because every assessment, be it an environmental, a policy or a financial one, is based on what we know; but when you look ahead, it’s outdated the moment you put it into place. If you want to step into the future, you need banks, investors and in this case the AIIB to become part of the development of the project, so their evaluation process can evolve with that development. Based on this conversation we started to build a coalition. Supported by the Dutch government, we partnered with the newly formed Global Centre of Excellence on Climate Adaptation, the Rockefeller Foundation, the International Architecture Biennale Rotterdam (IABR), Deltares, and other innovators to assess water and climate risks in South-East and South Asian cities. And so the “Water as Leverage” project was born. We had many options but to start somewhere we selected 3 cities: Khulna (Bangladesh), Chennai (India) and Semarang (Indonesia). These cities face complex challenges such as saltwater intrusion, soil subsidence, floods and droughts; all on top of migration flows and urbanisation. So in these cities we pitched a competition, not against each other but for the highest ambition, to find the best resiliency approach. International teams were challenged to partner, to find, and develop ideas in a collective, inclusive and collaborative way. These projects are the needed catalysts for change and can become starting points for replication, or at least inspiration, elsewhere. This spring we will evaluate this approach and come up with a more systemic way to apply the challenge to other cities. After all these 3 pilot cities won’t save the world. We need to do it everywhere. We need to focus on how to attract the finance world to partner with us in this approach of innovation; become a partner more on an institutional level and realise that this first phase – this “pre-project prep phase” – is the most important. By including the financial world in this new methodology, similar facilities or programmes can be scaled up in a region and beyond. CWR: Moving on to the US, you have helped re-build capacity in cities after various extreme events, even leading President Obama’s Hurricane Sandy Rebuilding Task Force. Have lessons been learnt from these crises? HO: Like China, the US is very large and there are challenges across the country. The east coast of the US is as vulnerable as South-East Asia when it comes to storms and you could say its vulnerability was not addressed enough before Hurricane Sandy. After the crisis our Rebuilding Task Force not only rebuilt the New York region in a more comprehensive, sustainable and resilient way; but we also tried to leapfrog. President Obama wanted to rebuild with an eye on the future, and that’s when I came up with an idea to organise a competition – Rebuild by Design – a predecessor to the “Water as Leverage” project. We selected 10 teams from the 148 that wanted to partner with us and over 9 months on the ground, we worked with 500+ community organisations, around 150 government agencies, schools, universities, and individuals across the regions of New York, Connecticut and New Jersey. We developed projects that were transformative, that had the opportunity to have a ripple effect, that would create resilient communities while building capacity, while at the same time talked to the hearts and minds of those people on the ground. The result was 10 groundbreaking projects and we selected 6 as winners, which were awarded with USD920 million. These projects are now in the building phase and are advancing very quickly by US standards. However, some have to negotiate a more complex political environment and need more time. President Obama was keen to repeat success on the national scale so I developed the National Disaster Resiliency Competition. This was inspired by the Rebuild by Design competition after Hurricane Sandy and takes the same approach. The difference? Without a disaster, there is no crisis to leapfrog upon to the future. Water is leverage in that sense: it’s piggy-backing on this. Take a crisis as an opportunity, embrace the complexities and step up. CWR: To wrap up, how optimistic are you for a water secure future? HO: I am very optimistic. Although I am often in places which are suffering, I meet a young generation that really understands the complexities and is willing to take it on as an opportunity. I also see that with the Paris Agreement and the UN SDGs that there is no escaping this challenge. We have to rise to this window of opportunity for change, or else we fail and that is not an option. Green Financing For Climate Resilience – We sat down with Dr Christine Chan from the Climate Bonds Initiative working group to get the latest on green finance globally & in China. How have China’s green bonds been received? What is next for investors?